This was to be or last day in Canada, so I think we left the best till last. Niagara Falls as they are collectively known, which are in fact three falls. The American falls are 323 Metres/1060 feet across including the bridal falls, named for their resemblance to a bridal veil and separated by an island called Luna Island. The amount of water flowing over these falls, per second is approximately 567,811 Litres, or 150,000 Gallons, this amount can vary depending on the time of day and time of year, there are two hydroelectric dams that utilize the fast-flowing water and the usage is quite variable and the power created by the hydroelectric dams is shared between the U.S.A and Canada. The Canadian, Horseshoe Falls, the largest falls, have a brink of approximately 792 Metres/2600 Feet. The approximate water flow over the Horseshoe falls is an impressive 2,271,247 Litres/ 600,000 Gallons per second, which of course is also variable according to the hydroelectric dam usage. Enough water for the entire UK population to shower at the same time. The Niagara Falls are the second largest falls in the world, next to Victoria Falls in South Africa. My daughter and I intended to make our last day a memorable one, and to have the most fun possible. I had booked a full day’s coach tour, starting at 9am. Our schedule was to be picked up from one of the airport hotels and after a packed day, full of wonder, excitement and thrills, were to be dropped off again at 7pm in the same place. We were up extra early and buzzing with excitement, we caught a local bus to get us to the pickup point and our experience began. 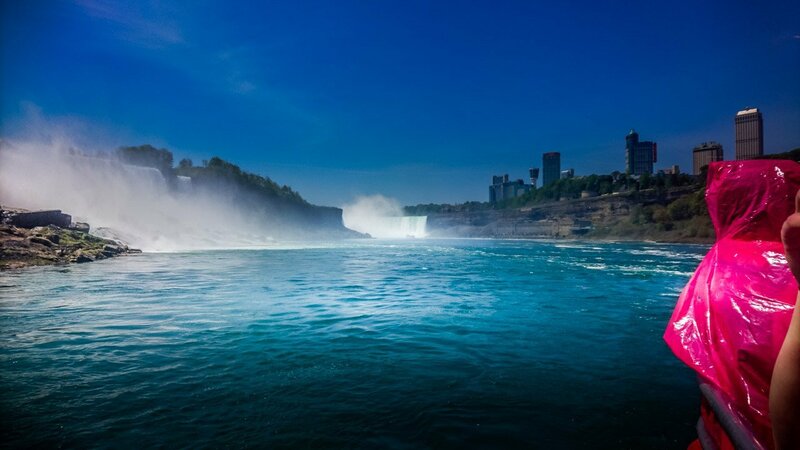 The Niagara whirlpools depth is 38 metres/125 feet deep, and to say its undercurrent is dangerously strong is quite an understatement. Niagara Falls whirlpool is the worlds 2nd strongest whirlpool behind Norway’s, Saltstraumen whirlpool near the town of Bodo, north of the Arctic Circle. 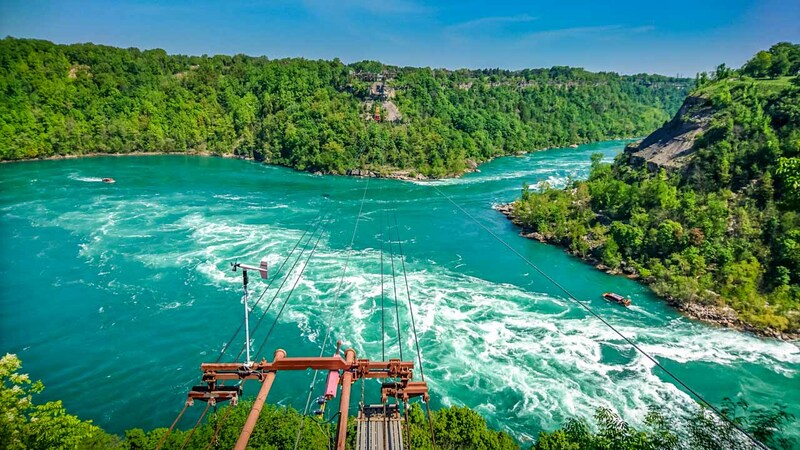 My daughter and I viewed the Niagara whirlpool from a view point near to the aero car station on the Canadian side of the Niagara river, the opposite side of the river is New York state, America. The Whirlpool Aero Car takes thrill seekers across the whirlpool for some fantastic views, to another Canadian point. 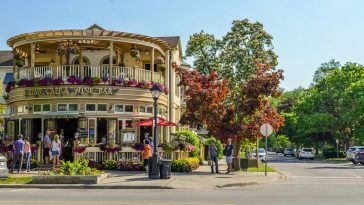 After a few photo opportunities and time to be well and truly amazed at the sight of Niagara’s whirlpool phenomenon, it was time to board the coach and onwards to Niagara Falls. Our arrival at Niagara was exciting, the schedule was firstly to head down to board the Hornblower Niagara cruise, and to fully experience Niagara’s 3 falls up close and get wet in the mist, followed by a wander along the river, and then, if that wasn’t enough, a full Canadian buffet lunch at the Sheraton Fallsview Restaurant at the Sheraton Hotel, with stunning views over Niagara Falls. Our small group gathered at the entrance to the Hornblower Niagara cruise whilst our driver and tour guide collected our entry tickets/lanyards. We were guided by a member of staff, avoiding ques and were handed our lovely pink ponchos ready to board the Hornblower, and yes, I did keep my poncho as a souvenir. As we set off, we quickly realized a position near to a hand rail would be a good idea, firstly to keep upright, secondly for some truly mind-blowing sights. The rainbow bridge crossing was behind us as we began our Niagara journey. 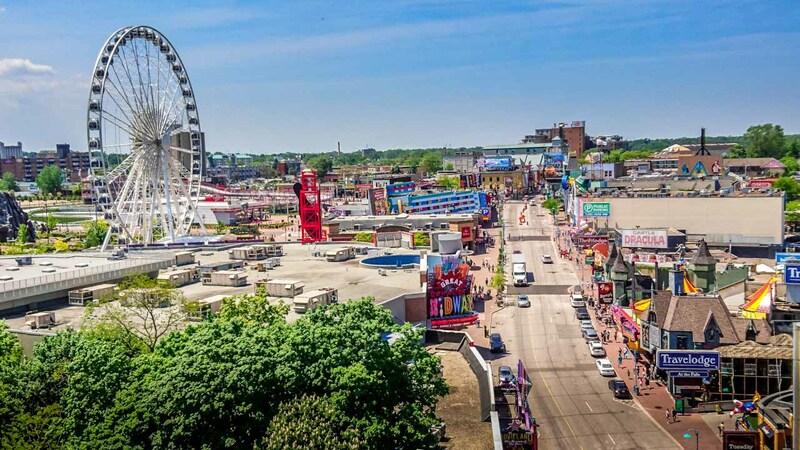 The rainbow bridge is also a border between Canada and America, so if you had intentions of crossing here, you would need your passport and a visa to enter the country. The American falls and Bridal Veil falls came closer into view as our cruise quickly crosses the Niagara river to take in the two falls across the American border which are 53.6 metres / 176 feet in height, unless you count the rocks below, making the actual drop 21.3 metres/ 70 feet. 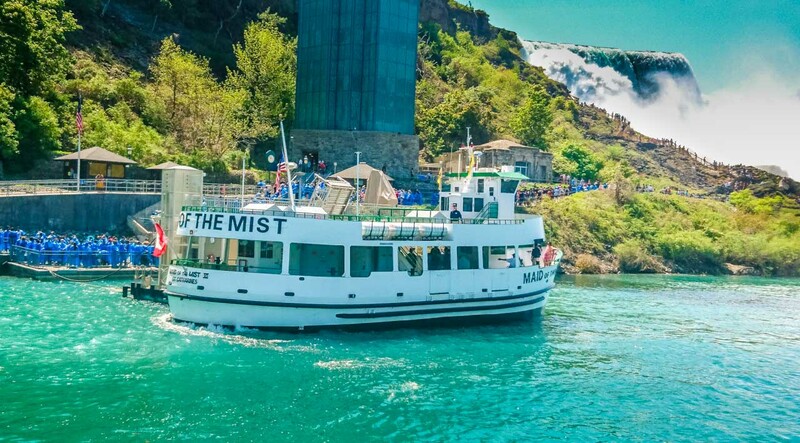 As we cruised by the American falls, The Maid of The Mist on the other side of the border was taking on passengers, all wearing their blue ponchos, some of us waved as we passed. The sights, and the sheer roar of the falls at this point is just so captivating, everyone aboard snapped their selfies, the sound of laughter is uplifting, and the atmosphere is pure electric, if only this exuberant atmosphere could be bottled. On the American side of the Niagara there is a view point next to the falls, and to get some scale, the people standing up there at the viewing area, well they looked like matchstick people to me, from our position on the river Niagara, below the American falls. Cruising onward, up the Niagara river to the Canadian, Horseshoe falls. Here the mist was really in our faces and so powerful that our ponchos were getting tricky to keep over us, there was no point in resisting the power of nature, the fresh smell of the mist I also found exhilarating. 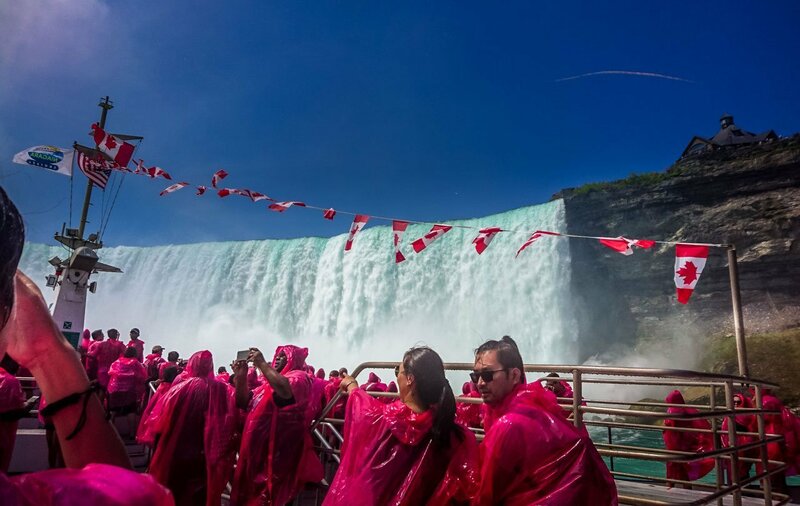 The pink ponchos have tie up hoods to keep you semi-dry but try as you might the powerful blast of the falling water, just knocks back your hair, your hood, and sprays a constant au-naturel Niagara Falls face treatment. 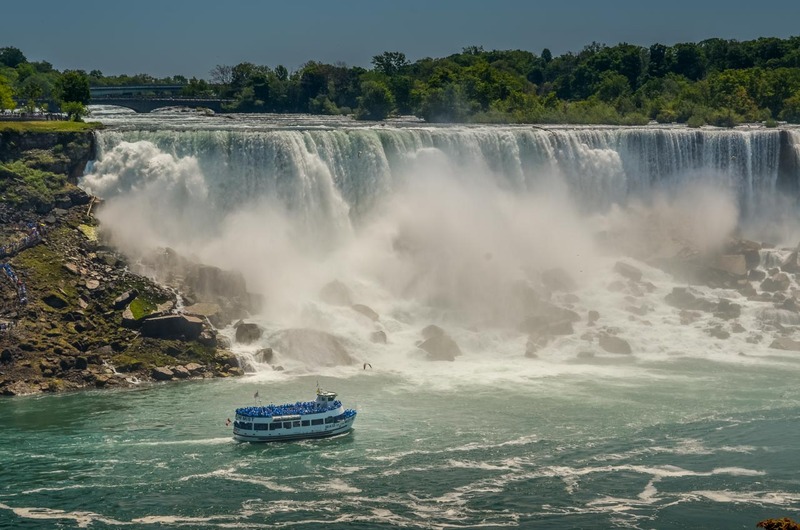 Here, at the base of the Horseshoe falls, with the enormous power of this phenomenon and the deafening roar in the mist, so loud that even the laughter and the chatter of all aboard the Hornblower was drowned out completely by the continuous thunder of the Canadian Horseshoe Falls. The height of the Canadian falls is 50.9 metres/167 feet, a staggering elevation indeed, and dwarfs all those below it in the mist. The water flowing over these immense falls, filters down from Lake Eerie and was created by the last ice age, 18,000 years ago, Southern Ontario was covered in ice over 2km thick and when it began to move, the colossal basins and gorges, which are now lake Eerie, river Niagara and lake Ontario were gouged out and as the sheet ice melted, it filled these great basins, it became ice free roughly 12,500 years ago, and the falls are still receding at a rate of roughly one foot per year due to erosion. Much of the water gushing and thrashing over the precipice of the falls is still ice water, only around 1% of the water is renewed each year by rain or off run. 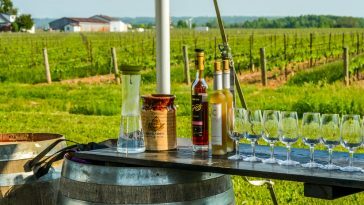 So, the mist on our faces, and saturating our hair, was in fact, “Fossil Water.” It is very clear that this IS and was for us, a trip of a life time. 4 of the 5 Great Lakes, Superior, Michigan, Huron, and Erie flow into the Niagara River before they reach Lake Ontario and finally, flowing into the St Lawrence River and into the Atlantic Ocean. The five Great Lakes make up almost one-fifth of the world’s fresh water supply. 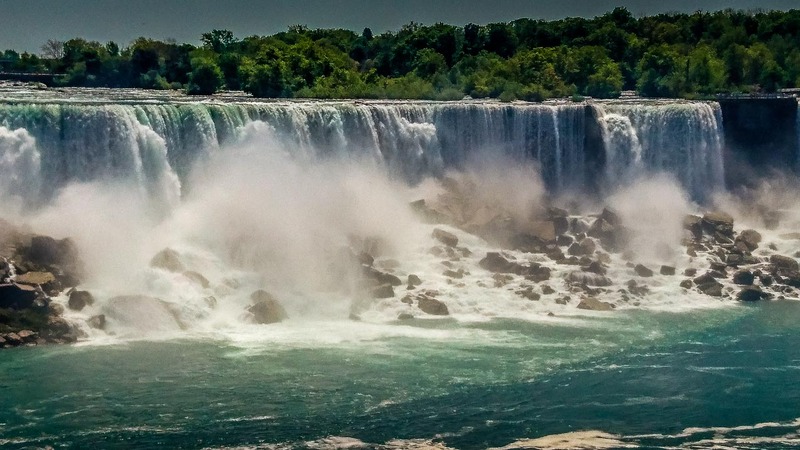 Fun fact; The word Niagara comes from the word “onguiaahra” which means “a thundering noise.” The 3 waterfalls combine to produce the highest water flow rate of any waterfall on earth. After our exciting Niagara Falls cruise in the mist, we had some time to reflect and to take even more photos, this time by camera and not just by phone. A walk along the Niagara river on such a beautiful sunny day was delightful and relaxing. 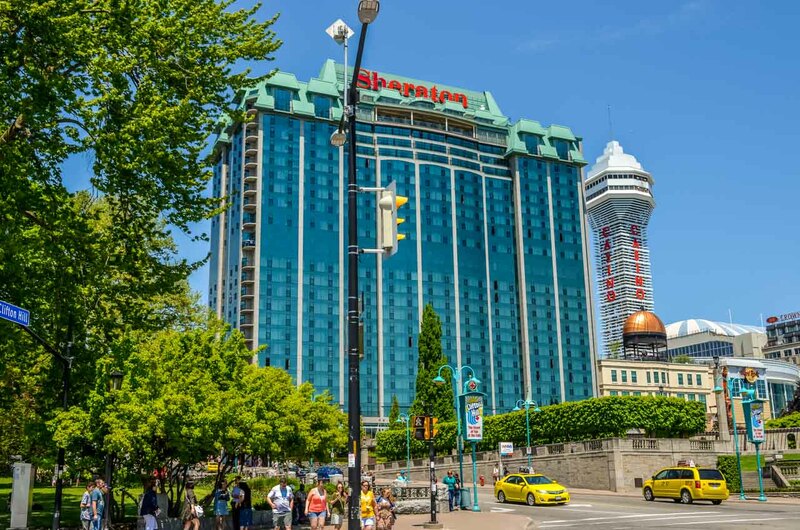 Here there are so many photo opportunities that it’s hard to know where to point the lens, but it would soon be time for lunch at the Sheraton Hotel, which meant time to walk back and join our group. We all took the lift to the Sheraton “Fallsview” Restaurant. My daughter and I were ready for lunch by this point, it had already been a long day. 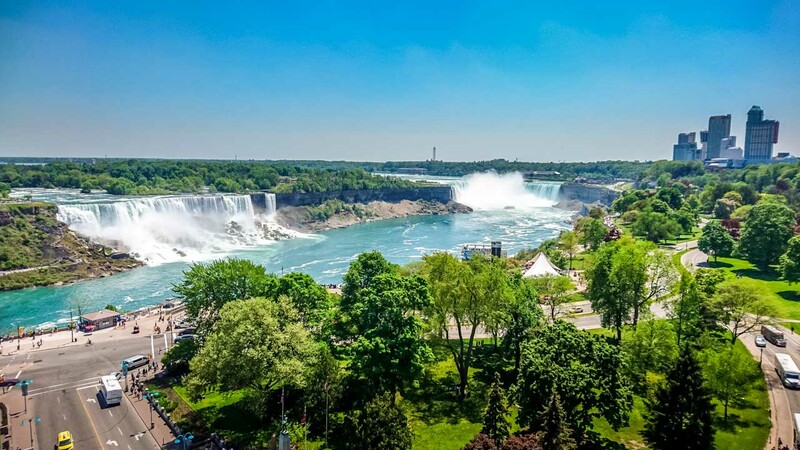 Our group had a table reservation with a window view over the Niagara Falls, the buffet lunch was delicious, a wide-ranging choice of hot or cold foods, the only problem was that of trying to eat, when you just can’t take your eyes off the spectacular view! This was a true wow factor, I think the views from the restaurant windows and that from the balcony, will be etched in memory forever, no camera needed. But of course, I took plenty of snaps anyway, well you know how it is! Our mother and daughter Niagara Falls experience was truly a trip neither of us will forget. 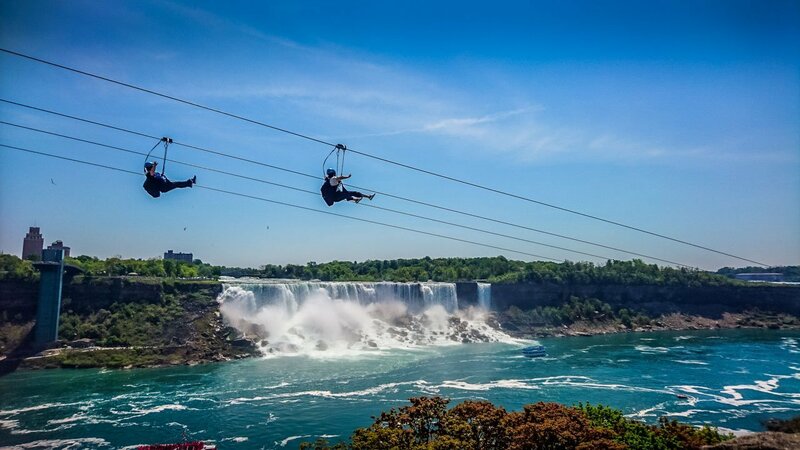 No wonder Niagara Falls attracts an estimated 30 million tourists every year. 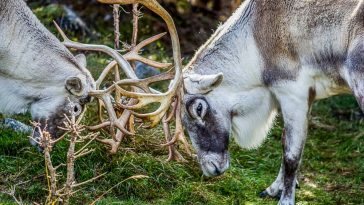 It was a completely immersive experience, fully guided, everything prepared and arranged for us, a matter of turning up and having the time of our lives. I love waterfalls wherever they are or whatever the size. the victoria falls are on the Zambezi River at the border between Zambia and Zimbabwe, in Southern Africa. The official location is South Africa. Like the Niagara Falls, they too are on the border in places, America and Canada being at a close point at Niagara. Sounds good!I’m a big waterfalls fan.bit out on Africa the Victoria falls are not in south Africa but on the border between Zambia and Zimbabwe! Here’s a question how many waterfalls are on national borders?well we’ve got two so far!